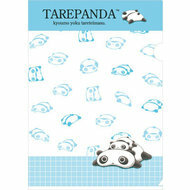 A beautiful sheet with seal stickers with the adorable Tarepanda from San-X, Japan. Pre-cut self-adhesive stickers. You can use these for a variety of purposes like decorating your filofax, diary or calender. Just cut, peel and stick! Tarepanda which means “lazy” panda or “droopy” panda in Japanese. More specifically “Tare” means lying on the tummy or can be described as slump down/slouch. These panda’s characters form by rolling around. How lazy? Just for your record TarePanda is so lazy and slow that moves about 2.75 meters per hour. (according to company literature) TarePanda loves to eat mochi (especially Suama, Japanese sweets).